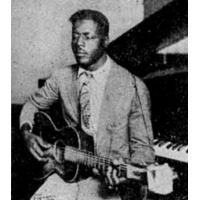 "Blind" Willie Johnson (January 22, 1897 – September 18, 1945) was an American singer and guitarist whose music straddled the border between blues and spirituals. While the lyrics of all of his songs were religious, his music drew from both sacred and blues traditions. Among musicians, he is considered one of the greatest slide or bottleneck guitarists, as well as one of the most revered figures of depression-era gospel music. His music is distinguished by his powerful bass thumb-picking and gravelly false-bass voice, with occasional use of a tenor voice.